Tesco receipt-based Price Check - live! You must go and have a look at our excellent new Tesco Price Check web application. We are introducing Price Check so customers will have no doubt that we offer the best value. Price Check gives customers the ability to check the price of individual products and the total price of their shopping and, in the unlikely event that we are not cheaper than Asda, we will refund 'double the difference'. The system works by looking up your receipt details and checks that we are the cheapest compared to Asda. If we aren't then you get double the difference back as refund. If you are old enough to remember the excellent BBC show "Challenge Anneka" you'll recall the format where Anneka Rice is given some seemingly impossible task to deliver on a specific date. For (contrived!) example, she reads out a card which says: "On May 1st the Mayor of AcmeTown will be opening the new pedestrian bridge across the river which will join the two halves of the town together and your task is to make that day a total success." to which Anneka says to the camera that doesn't sound much of a challenge. "Except," continues the card, "the bridge doesn't exist yet - oh and no mayor has been elected yet". After which Anneka does everything in her powers of persuasion to make this all happen, which she does of course. I am one of those people who are, to quote a businesse cliché and to very much follow the Challenge Anneka format - "delivery focussed". Indeed I choose end dates where I will show-and-tell something or other, and plan backwards in minus weeks. I have a big project going to show-and-tell at the end of the March, and currently we are at week -5. A twist on this message is that I can't see the point of doing something for its own sake. I often prefer to self-teach than to go to a class and do some work that will just get thrown away at the end of the course. I'd rather grab a good reference book, follow the examples, and get stuck into what it is I'm actually trying to achieve that made me want to learn whatever-it-was in the first place! With all this in mind, I have to tell you that sometimes people ask me what life will be like in 10 years time. They want me to, no doubt, espouse some delicious dream of a future digital loveliness of some kind. The trouble is I often suspect that 10 years in the future will be much the same as it is today, only with a little more social networking and a lot more expensive. It's fortunate that, at Tesco.com, 10 years is such a long way away - and with so much to do in between - that I rarely get asked to think that far ahead. 5 years is quite enough to be getting on with. However, out at the 10 year point on my timeline I do have a project called 'Robot'. It's been put there there quite deliberately by me and I have no idea what it looks like. Perhaps its a robot Tesco.com delivery driver, or a robotic product picking warehouse. Or it could be that R&D replaces the entire Tesco.com leadership team with a set of robots that say, "Yes Nick" to my every request and whim! The point of 'robot' is to try and reach the unreachable - a device that makes me glance out far into the future to understand what shape and form the world - and our market - will be in that far ahead. But my "robot" project is a 10-years-away idea. It has no evidence to support what it might be or what it might do. It's not really an idea, it's a dream. Ideas without evidence are dreams. It's my job to try and gather evidence to support and/or weaken the project. "Ideas without evidence are dreams". Hey what a great phrase! I just thought that up! Just checked on Google and nobody else has said it. So unless someone challenges me with non-internet evidence, I'm laying claim to it! When I look through the rest of our list of R&D projects in our backlog, I see that they are not dreams but ideas with evidence to support them and delivery objectives to accomplish. That's just the way I like it. And you can quote me on it! "Ideas without evidence are dreams"
The second day spent at MWC started with the developer event with HP introducing webOS, there's some really cool UI stuff going on here, like 'Just type' and coupling of browser screens. After a stop-off at the Blackberry stand to experiment with the Playbook and the HTC stand to check out the new HTC Flyer; the Android 'park' was next on the list. It couldn't have got more exciting with Doughnut, Gingerbread and Honeycomb smoothies coupled with a giant Android slide, yes you heard me and there is photographic evidence to prove it. The number of tablet devices here at MWC is striking, almost every stand has got one on (it's hard to differentiate between all of them too!). What's interesting is that HTML5 is the common factor to all of them, indicating that this is the future platform for apps, both web and mobile. It opens an interesting debate here at Tesco for what we deliver to our customers and their expectations over the coming months. I arrived at the airport still seeing mini Androids (see photo above) so I think their clever marketing paid off. As for our Android customers reading, we have something just around the corner for you! My colleague from our web/mobile development team is Rebecca Pate, who is spending a week as our eyes and ears at Mobile World Congress in Barcelona, where she is Techfortesco's intrepid reporter! As a quick intro, my name is Becky Pate (@rpatey) and I am the Mobile Product Owner here at Tesco.com. Mainly, I am responsible for the ‘what’ for our mobile apps and sites that have launched over the past 12 months (all featured on Nick’s blog of course!). I work closely with the @ribot team on the design side, @nicklansley and @anexplodedview on the innovation and technology front and our development and test teams to get stuff out to customers and also help us review, improve and update our products. My role also requires me to keep close to customers and the technology to understand how we can improve the Tesco mobile experience. So in a nutshell, that’s how I’ve ended up in Barcelona at Mobile World Congress and, given that I’ve be meaning to hijack Nick’s blog for a while, this seemed like the perfect opportunity! With over 50,000 visitors, an exhibition space of 365 square metres of floor space (which is larger than 40 Tesco Extras put together!) and a 6am start to avoid the queues, it’s hard to know where to start. The day started with 3D face animation, personal handwriting and gesture technology alongside 3D Smartphones and a touchable 3D display (a gecko ‘jumped’ out of the device and almost bit me!). I also saw an impressive app on a tablet device that sits in your car and enables you to start the car engine, change gear, adjust the temperature and everything else that your car would need to do, as well as syncing with your Smartphone to capture any disastrous images if ever you were stuck in a tricky situation! Android Honeycomb on the Motorola Xoom and Samsung Galaxy Tab 10.1, are also ones to watch - a camera on the device really makes a difference and they are so simple to use. HP’s webOS was really cool with its “touch-to-share” technology allowing users to share information such as URLs from Smartphone to tablet devices (if they have the same webOS account). I’m looking forward to finding out more tomorrow. Few things have excited me as much over the last few months than the work that Microsoft has done to create Windows Phone 7 (WP7), and the news that came in last Friday announcing that they have teamed up with Nokia (or Nokia has teamed up with them, or both!) brings me yet more joy. The excellent user interface. Abandoned (finally!) is the attempt to make the phone interface look like a Windows desktop. The WP7 interface is different, engaging, and pseudo three-dimensional. As the owner of the US-edition of a Zune HD player, I had an early access to the new look and I absolutely loved it from day one. The reason is that your mind can get used to the many options across the various screens quickly because the 3D-esque interface acts either as a turning page or as a zoom-in to each lower level / zoom-out to each higher level. I never lose sense of where I am. It looks good, too. The joy of programming it! Sometimes I pull my hair out when I'm programming in Apple's Objective-C (the iPhone's computer language) and have to set running special 'objects' just to join two text strings together. Microsoft's C# (Java-like) language for the variant of the .Net Framework for WP7 is just set at the perfect level - "high enough" to cope with coding I don't need to think about (e.g. joining two text strings together by simply coding "text string 1" + "text string 2") but "low enough" to get down and dirty with efficient algorithm programming when needed. I code all my R&D projects in C#/.Net - and the Tesco API is coded end-to-end in it. Its reliability and performance is astounding. So why my additional joy at Nokia joining the party? Simple: I think Nokia make the most reliable hardware - honed and tuned from years of skill and experience. My Nokia phones could be dropped, sat on, thrown about and they still work to this day. I think they still make the best looking hardware as well - I still have the gorgeous Nokia 8110 slide-phone as seen in the movie The Matrix - and it still works wonderfully albeit on only GSM 900 networks (O2 / Tesco and Vodafone in the UK) despite its heavy use in its day, and a few years left on the shelf with its battery still connected. So, bring Microsoft and Nokia together and... well I better start saving up 'cos I'm going to be first in the queue. Are big businesses missing out by putting the iPhone above Google Android? Take Tesco for example. It’s hard to avoid their TV ads promoting their iPhone app which allows people to scan barcordes to generate a shopping list and then order items. A great idea, which makes it even more shocking they are yet to launch an Android version. It seems they’re working on it. Nick Lansley, who blogs on the supermarket’s technological endeavours, has said as much, but that was back in September and four months down the line there’s no indication of when it will be launched. @techfortesco Tesco Groceries app for Android not far away now. Patience, android fans, for just a few more weeks. We want it perfect. I think that says it all - and I'll keep using my Google Nexus One as my main 'phone until at least the app has launched (colleagues keep testing me during meetings to confitm that it is still my primary phone!). 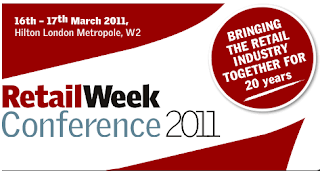 I will be speaking at the Retail Week Conference 2011 which takes place in London on 16-17th March at the Hilton Metropole hotel and conference centre. Over 800 delegates are expected to attend so I hope to meet several of you techfortesco readers there. Don't hesitate to make yourself known to me - indeed why not let me know beforehand and perhaps we can organise a get-together during the conference. I am on stage at 11:20am - 12:00 on 17th March presenting during Stream C: Technology Think Tank where I'll be taking delegates on a deep dive into our attitudes and focus on customer insight & evidence that has brought success to our mobile e-commerce strategy through a holistic approach. If you find that intriguing, will you leave my presentation as a Hunter, Gatherer, or Groundhog?! For more details of my fellow speakers, including Tesco UK CEO Designate Richard Brasher, and Tesco UK Marketing Director Carolyn Bradley, follow this link. I'll also be around that evening for the Retail Week Awards ceremony where we have submitted our entry to be included in the category Multi-Channel Retailer - so fingers crossed!